How many hors d'oeuvres do I serve for a cocktail party? Count six hors d'oeuvres per person, per hour. How should I plan the menu? Balance between hot and cold, rich and light. Be sure to provide at least one vegetarian offering. And always choose a few make-ahead dishes so there's less to do on the day of the party. How much wine do I need for a cocktail party? The rule of thumb is three glasses per person. So for a cocktail party of 20 people, that means 12 bottles. The standard bottle is 750 milliliters, which is about 25 ounces. That's five 5-ounce pours, which is considered the standard amount. How long does it take to bring wine from room temperature to serving temperature in the refrigerator and/or freezer? White wine should be served at 55°. It will take one-and-a-half hours to chill in a refrigerator, or 40 minutes in a freezer. Red wine should be served at 65°; that's 20 minutes in a freezer. What is the fastest way to chill white wine? Fill an ice bucket a third of the way with ice and another third with water. Submerge the bottle in the mixture, adding more water if needed to cover the bottle to its neck. The wine should be cold in 10 to 15 minutes. Should I rent glassware or buy it? For parties of 20 people or more, getting glasses from a party rental company makes sense: It will cost no more than $1 per stem, and there's no cleanup. If you throw lots of parties, buying glasses is more cost-effective. Can I use the same style of glass for red wine, white wine, water and Champagne? Yes, for three of the four. The Riedel Vinum series Zinfandel/Chianti glass ($40 for two; amazon.com) is high-quality stemware that works very well for both red and white wines and can serve as a water glass, too. Champagne, however, is really best in flutes. 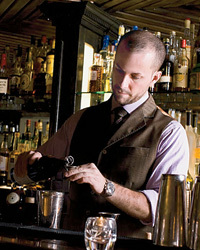 As managing partner of New York's PDT and deputy editor of the F&W Cocktails annual guide, Jim Meehan test-drives every new mixology ingredient and tool. Here, his new favorites. "Damson plum gin is an English classic, but it's often very sweet. Averell keeps the gin flavor instead of burying it in sugary fruit." drinkupny.com. "These measuring tools are functional and beautiful, like Japanese jiggers, but they have US increments." cocktailkingdom.com. "I love this brand of chocolate bitters for tequila cocktails, but it also works well with rum and whiskey drinks." cocktailkingdom.com.